The Panic of 1873, brought on by the failure of Jay Cooke’s banking house, decimated Duluth. All work stopped, and the population was slashed practically overnight. By 1877 Duluth, heavily in debt, had lost its city charter and reorganized as a village. While things looked bleak, that same year there were indications that the Zenith City was back on the rise, none more significant than the establishment of the Bell & Eyster Bank. Six years later the bank and Duluth were thriving, so Henry Bell and partner William Eyster built a marvelous brownstone facility on East Superior Street to house their financial institution. While Bell & Eyster’s Bank is long gone, their building remains as a reminder of the optimism over Duluth’s future that drove its pioneers to success even in the community’s darkest days. Henry Bell arrived in Duluth less than a year after Cooke’s failure and went to work for the First National Bank, established in 1872 by Duluth pioneers J. B. Culver and George C. Stone. Bell left First National two years later, opening a small exchange bank. An 1886 report on the city of Duluth states that “[Bell’s] integrity was so well known, and his popularity so great, that he at once received a very profitable patronage.” In 1877 he partnered with William C. Eyster—a resident of Duluth since 1871—and with $10,000 in capital (about $220,000 today), they opened the Bell & Eyster Bank. About the same time Bell & Eyster opened their bank, the Red River Valley was being turned into fields of grain, and lumber barons had nearly played out Michigan and Northwestern Wisconsin and were turning their sights on Northeastern Minnesota’s timber stands. During the next six years Duluth slowly became a lumber-milling and grain-trading center and the Zenith City began to pull itself out of debt. The population increased—and along with it business at the bank. In 1883 Bell & Eyster hired renowned St. Paul architect George Wirth to build them a facility worthy of their bank’s reputation near the very heart of the business district at the intersection of Superior Street and Lake Avenue. Their new brick building at 3 West Superior Street stood three stories high, 25-feet wide, and 120-feet long. It was faced with Fond du Lac brownstone inlaid with terra-cotta tile and cost $15,000 to construct (roughly $375,000 in today’s dollars). The following year stone carver Albert P. Clark chiseled the words “Bell & Eyster’s Bank,” accompanied by a wreath of oak leaves and acorns, on the west side of the bank’s entrance. 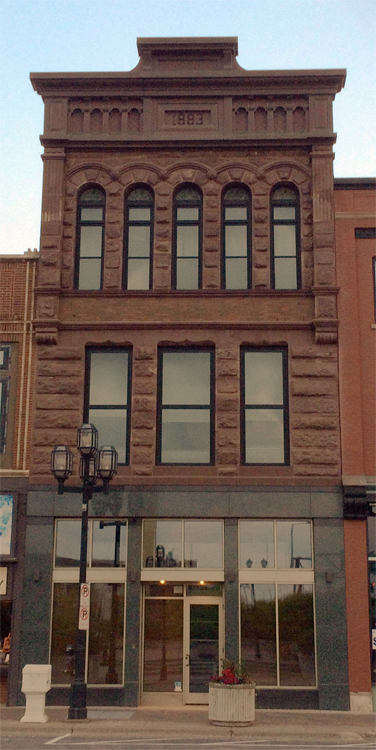 Clark had also done the carving on the 1884 Alexander Miles Block at 19 West Superior Street, also designed by Wirth. An 1886 report on the city of Duluth claimed that the Bell & Eyster Bank had conducted over $35 million in transactions in 1885 (that would be over $900 million today). But that same year, just as it seemed there was no end in sight for the growth of their business—William Eyster retired at age 53. The following summer, while visiting his hometown of Chambersburg, Pennsylvania, Eyster died. The Bell & Eyster Bank was tied financially to the Baring Bank of London, England. In 1890 the British firm’s risky investments in Argentina turned sour and the banking giant faced bankruptcy. Other English financial institutions bailed Baring out, but its smaller associates across the world had no such benefactors. Bell & Eyster did not recover and went into receivership. Former Duluth mayor Clinton Markell took over the bank’s assets, which likely served in part to calm concerned citizens: at the time, the city had $80,000 deposited at Bell & Eyster, just over $2 million in today’s dollars. By 1895 the Bells had moved to California and settled in Oakland. It took nearly a decade to sort out the mess left in the wake of the bank’s failure. When all was settled Markell sold the building to Mrs. Frances Kenney, who repurposed the facility. Optician C. D. Trott moved in in 1900, the same year Duluth’s most-popular milliner, Madame Ward, took up residence on the second floor. The third was rented out as a residence. The next year Mrs. Kenney sold the building to Davis Realty. By 1908 both businesses had moved out of the Bell & Eyster Bank. Two years later, Henry Bell died in Oakland. The Kodak store remained in operation until 1956, when it became Millard Berg’s Camera, suppliers of photographic equipment and supplies. In 1964 the store’s name changed to Camera Land and operated until 1971. The following year Villa Capri opened in the building and served pizza there until 1979. A series of tenants occupied the building for the next 25 years: Creative Collection Art Gallery (1981–1982), Shadow Masters Tattoo (1983), C&B Stamps, Coins & Hobby (1984–1988), and Tony’s Trading Post (1992–2003). 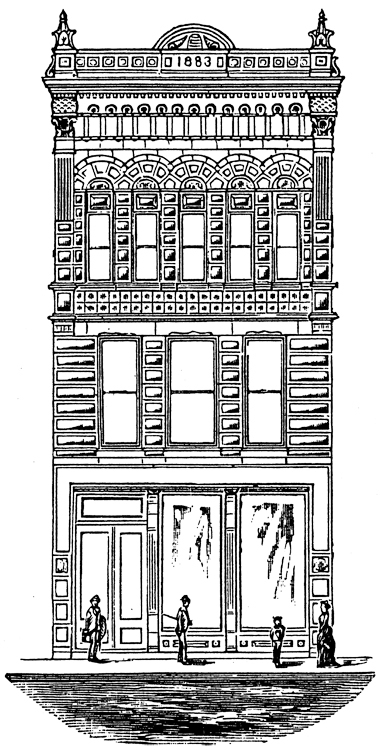 After Tony’s closed the building was purchased by the VonJaro Company, who also purchased the buildings at 1 West Superior Street (built in 1884 as Camille Poirer’s shoe store) and 5-7 West Superior Street (the 1886 Norris-McDougall Block). VonJaro planned to renovate all three buildings, beginning with 1 West Superior Street. It is unclear if the company ever began work on the Bell & Eyster Bank. In 2007 the Zeppa Foundation purchased the building and the interior was dramatically renovated. The upper floors were turned into a single-family residence, the first floor into a yoga studio. The exterior was also renovated and restored. A new copper façade was applied to the top of the third floor, including the legend “1883,” mimicking the brownstone relief that originally adorned the building. The one-time bank reopened as Yoga North in 2008. In 2011 the Spiritual Deli Yoga Center replaced Yoga North, but closed that same year. The Minnesota Wine Exchange Restaurant took up residence there in 2014 but closed in January 2015 citing the lack of tourist traffic during the winter. The building last traded hands in September 2014 when it sold for $825,000. Today the “really elegant” Bell & Eyster Bank has been restored to its original elegance, yet its Superior Street level sits empty, waiting for a new business to move in and write the next chapter of this building’s history.